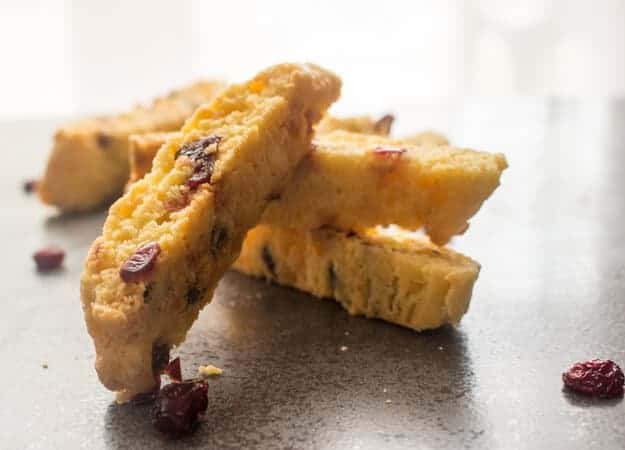 Italian Cranberry Almond Biscotti, a delicious crunchy Italian Cookie, filled with dried cranberries, Almonds and White Chocolate Chips. A yummy addition to your Christmas Cookie Plate. Today I am sharing a wonderful recipe that was given to me by my Mother’s cousin. I first tasted these when she made them in Toronto. I loved them then and I still do now. 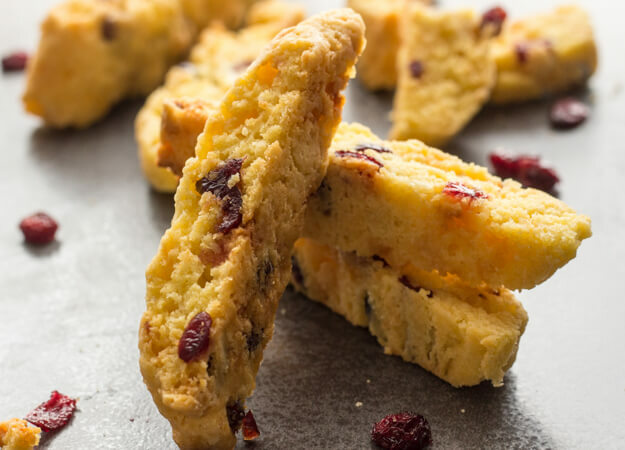 Italian biscotti are so easy to make and of course twice baked and at a lower heat. I usually make mine with butter, which makes them a little softer. But if you like your typical almost-broke-that-tooth Biscotti then a light Olive oil is best. A while back I was asked to join the International Cookie Exchange and of course I didn’t hesitate. I thought it would be a great idea to share some Delicious Cookies that are made in other Countries. Hope you enjoy them! Happy Baking. 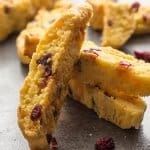 Italian Cranberry Almond Biscotti, a traditional Italian Christmas Cookie,fast,easy,yummy & crunchy. Cranberries,almonds and chocolate chips. Pre-heat oven to 300°, line cookie sheets with parchment paper. In a large bowl, mix together oil( or butter) and sugar until well combined. Add vanilla, then beat in the eggs. In smaller bowl, whisk together flour, salt, and baking powder Stir gradually into egg mixture. Fold in cranberries and nuts. Batter will be heavy and sticky. Cool in fridge for approximately 20 minutes. Form dough into 4 or 5 logs (6 x 2 inches app.). Place on prepared cookie sheet. Bake for approximately 35 minutes, or until logs are light brown. Remove from oven, and set aside to cool for 10 minutes. Reduce heat to 275°F. Then cut logs on the diagonal into 3/4 inch slices. Lay slices on the side on prepared cookie sheets and bake for approximately 8-10 minutes. Let cool completely before serving. Enjoy! After cooling for 10-15 minutes, the biscotti crumbled a lot while cutting. If left to cool completely, these slice much better. The taste is good though. I need to make these gluten free as well. What do I need to do to adapt the recipe? Hi Susan, I don’t bake gluten free, so I really can’t advise you on how to convert the recipe. Sorry. Thanks so much Lana, glad you enjoyed it. Hi Otilia, I added metric, so under ingredients it shows Us Customary and Metric, click on metric and it will give you grams. Hope that helps. Thanks for the Metrics, Am a home baker but have found that Metrics and weighing on a scale, especially with yeast breads, is a much better way. 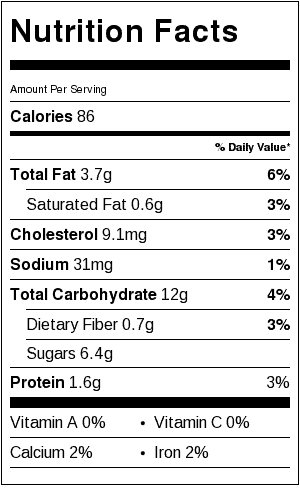 It eliminates a lot of the errors that can occur in measuring out ingredients. Very much enjoy your recipes and commentaries. Brings back some great memories of our trips to Italy. Hi Jack, your welcome and yes I agree metric is so much more precise. Thanks so much, glad you enjoy the recipes and my little stories. Have a great weekend. Just made a batch for Christmas, having given the recipe a try a couple weeks ago. They are delicious and so festive for the holidays. Thank you for a recipe that I’ll use again & again! Hi Katherine, so glad you enjoyed them. Have a wonderful Christmas. Hi Rosemary, I am not sure what happened but my biscotti came out flat!!! Just like a cookie. I used butter and substituted pistachios for the almonds. Any ideas what happened? Hi Cathy, and you followed the directions perfectly? My first guess would be check your oven temperature. That happened to me with cakes, every single one, flat as a pancake, and it was my oven. Let me know. Beautiful! The combination of cranberry, almond, and white chocolate sounds incredible. Thanks Tara, it is a pretty good combination. I just made these. Love them! I froze a few just to see how they would hold up for a week in the freezer. Hi Cathy, thanks, so glad you like them, I think they will be fine in the freezer. Let me know. love them but when cut they broke up a bit. what did I do wrong. Hi Sheila, when did they break up before the 2nd bake? Or after, if after probably because they are crunchy. Before did you add extra flour? Let me know. Cranberries + white chocolate + almonds. What else do you need? These biscotti look gorgeous! Hi Igor, thanks, I agree a good combination. 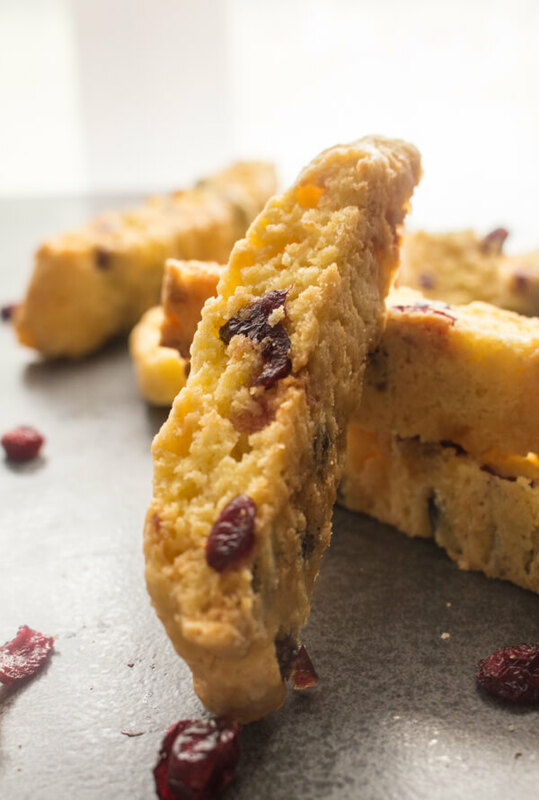 Love this festive take on biscotti! I’ve only made some once in my life, but I am adding these to the list now! Thanks Olivia, I hope you enjoy them. Have a great week. 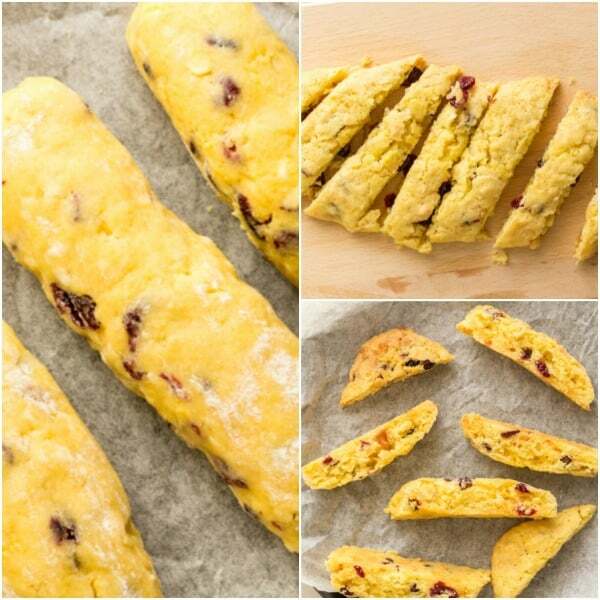 I love biscotti but I never tried making them. Now I need to try these real soon! Hi Cindy, I hope you enjoy them. No Christmas Cookie platter is complete without Biscotti. Thanks Wendy, exactly, we love Biscotti. What a wonderful flavor combo for biscotti! And great tip about butter vs olive oil for texture in these cookies! Thanks for joining in the cookie fun! Hi Sarah, thanks and yes it was cookie fun.